MANILA, Philippines — More than 100 communist guerrillas stormed one of the world’s largest pineapple plantations in the southern Philippines, killing a guard and torching farm equipment in their biggest attack this year, officials said Wednesday. At least two other guards and a villager were shot and wounded by the New People’s Army guerrillas, who barged into a residential, recreational and office complex on the vast plantation of Del Monte Philippines Inc. late Tuesday in Manolo Fortich town in Bukidnon province, Army Lt. Col. Eugenio Osias said. 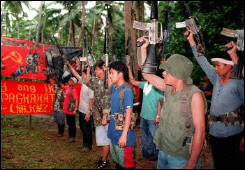 Shortly before the assault, the Maoist guerrillas, who were disguised as army soldiers, blocked a patrol car carrying three police officers at a bridge in Manolo Fortich and seized weapons from them, Osias said.Reinforcement troops clashed with the rebels for 20 minutes prior to the Del Monte attack, but the guerrillas managed to withdraw and proceed to the plantation, where they shot to death a guard at the gate and later wounded two other guards, regional police chief Catalino Rodriguez said.The Maoist rebels burned farm equipment and destroyed a number of computers in an office. They ransacked buildings and seized firearms at the plantation’s Camp Phillips, a scenic complex of country homes, a golf course and a clubhouse for farm officers and workers, Del Monte senior manager Ramon Velez said.The rebels also burned a small Del Monte office building and a fertilizer warehouse in nearby Sumilao town, according to Velez.Rebel spokesman Jorge Madlos said Wednesday that the assaults were punishment for Del Monte’s refusal to heed a guerrilla demand to stop expanding its already-vast plantations, which they blame for harming the environment. […]Washington regards the New People’s Army as a terrorist group, accusing it of attacks against Americans in the Philippines.